Happy New Year! We're excited to kick off a new year of Design 101 with a topic we get a lot of questions about - furniture placement! It can be a challenge to figure out how to fit furniture into your home in a way that is both functional and appealing. We have walked into a lot of homes where our clients have said, "something just isn't right". If you find yourself saying the same thing, you're not alone! This month we'll give you tips and tricks to use furniture in a way that makes sense. Although it may not be the most fun aspect of redesigning your space, figuring out the basics of furniture placement is an essential step! Later this month we'll discuss furniture layout ideas for every room of your home. But first, you'll need to understand your space! Below are easy to follow steps to help you get started. One of your new year's resolutions must have been to organize, right? Lets get started! It's always easier to plan a space when you have an empty canvas to work with. If that's impossible, at least try to remove anything you no longer need or use. Getting rid of clutter can help you look at your space with a new perspective. Especially if you're going to start moving around heavy pieces of furniture like your sofa or dining room table! With a measuring tape, measure each wall of your room, the windows, and the doors. Take not of whether the doors open in or out. Draw the room on graph paper. 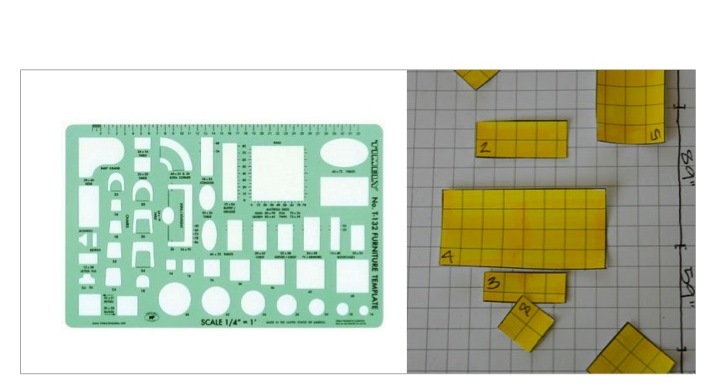 Each 1/4 inch square should equal 1 foot. This will create your floor plan. Whether you're using your existing furniture or buying new furniture, you'll need to decide on the essential pieces for each room. For example, a living room is completed by using seating (sofa, love seat, chairs) with side furniture (coffee tables, side tables, shelving units). Perhaps you also have additional accessories for your living room (TV, sound system) or accents (art, books, lighting). Also think about the flooring - do you have a rug in mind? If you own pieces that don't fit within the essential list of furniture for each room, keep them on a side list for now. Ultimately, if they don't work in the room you are planning now, they might work in another part of your home! Before making purchases or placing anything, you want to make sure pieces will fit in a way that makes sense. Measure your furniture. 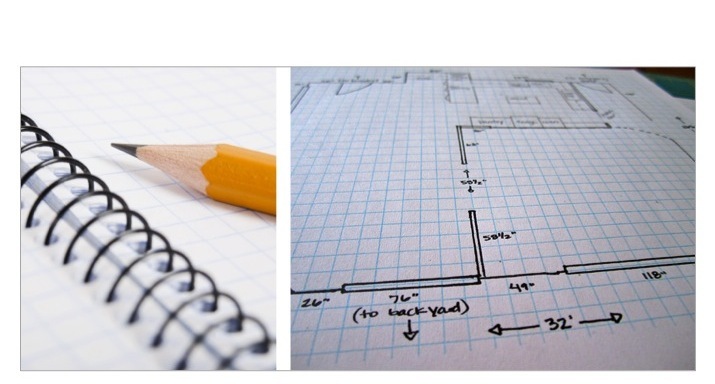 On a separate piece of graph paper, make a template for each piece of furniture using the same 1/4" = 1'-0" ratio. Rearrange the furniture templates on the floor plan to see what you like best! If you want to take additional precaution before ordering or placing furniture, or if the idea of drawing a floor plan overwhelms you, fear not! You can mark each piece of furniture in your actual space with masking tape or painters tape to get an idea of how the furniture placement will work. In lieu of tape, you can also lay down newspaper to mark out where each piece will go. Trust us, even the experts do this! If you want to go the extra mile with your floor plan, you could cut small pieces of your furniture fabric and glue them to each furniture template. This will help give you a sense of how the room will come together aesthetically. If you don't have fabric snippets available, markers will do! READERS: Do you have a furniture layout dilemma in your home? A room that is shaped in a way that makes it impossible to furnish? Let us know and we might feature you next month by giving you free design advice! Up Next Week in Design 101: Living Room and Family Room Furniture Layouts! Stay Tuned!